Boston,: Harvard Business School Press, 1988, 1988. HC and DJ. Presumed First. 9 1/2 x 6 1/2. ISBN:0-87584-191-0. 234pp + index. Subtitled: Managing Joint Ventures with a spotlight on China and Japan. Hands Across the Ocean is an indepth probe of the s trategies and tactics of companies forming international joint ventures. Some are establishing a jointly owned third company whose profits are shared, and others are working together on specific proje cts without a formal organization. In state controlled or mixed economies the local government and an outside firm are the partners. This book describes the development of joint-ventures in detail. Th e author traveleed to six countries and interviewed over 100 executives at firms involved in joint ventures. Everything one needs to know to get started. DJ has min rub on rear; 2 very small tears, ot herwise bright tight clean unblemished. new mylar protector. Blue cloth on boards mint condition. White endpapers: pristine. No former owner's name. 6 pages have tidy highlighting - otherwise v. good. Interesting case studies, index. A very nice copy of this book. Dj: v. ggod, Binding: fine, Text: v. good..
Toronto: Sir Isaac Pitman Canada Ltd, 1967. This is a set of two books, the hardcover text with the softcover student's key. Text has bumps to corner and a small dent to front side edge and bit of soiling. White softcover has a bit of soiling but little wear. Bottom have former owner's name on inside cover. pages are clean and unmarked. No corner folds.100 units. Back free endpaper has some Pitman notation in pencil. Last few pages of student's key has some moisture damage but text is not affected.. Presumed First. Good. Loganville, Georgia: International Loss Control Institute, 1987. 133 pp. includes bibliography. 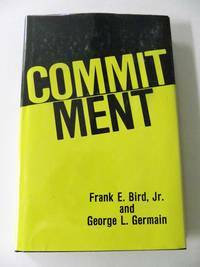 A business book that emphasizes that the level of product quality required to compete will not be achieved without complete employee commitment. The proper approach to total quality is to demonstrate a clear concern for both people and product in ways that reinforce each other - rather than having them compete for precious time and attention. Dustjacket has some scuffing and a couple of short tears to edges. Looks great in new mylar cover. Black paper on boards binding with bright gold gilt lettering is in lovely condition. No former owner's name. Text is clean tight and unmarked. A nice copy of this important book for managers.. Presumed First. HC and DJ. Very Good/Good. 9 1/4 x 6 1/4. London: Pan, 1979. 190 pp includes index. For managers in industry, commerce, hospitals, public administration or elsewhere, the book's aim is to help the manager to understand his organizaional problems and to know what are the advantages and disadvantages of different ways of dealing with them.Softcover has no creases to corners, a faint crease to spine, clean . No former owner's name. Text is clean and unmarked. A very nice copy.. Third Printing. Mass Market Paperback. Very Good. Scarborough, ON, Canada: Prentice-Hall Canada, Incorporated, 1977, 1977. HC and DJ. 9 1/4 x 6. ISBN:0-87909-300-5. 287 pp + index. Managers, engineers, students, or scientist will find this discussion of the strengths and limitations of widely-used forecasting techniques. Equations, examples and illustrations to develop forecasting in one's particular area of specialization. 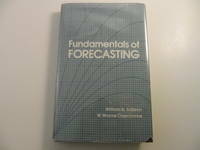 Provides a computer program for making forecasts with the techniques discussed in Chapter 5. DJ has a tear to top and a tear to back top edge. There is a triangular chip about 3/8 x 3/8 at lower front corner. Looks great in a new mylar cover. Black paper on boards binding with silver lettering is in excellent cond. No former owner's name on endpapers - very clean. Text is very clean and unmarked. DJ cond: good Book cond: v. good - near fine..
Englewood Cliffs, N.J.: Prentice-Hall, Inc., 1978. 222 pp. + Index. Learn Basic principles of management by objectives, myths and realities about management by objectives, The objectives oriented manager and worker, the reward centered environment, analyzing problems and setting objectives, top management by objectives, operational management by objectives, problems` pitfalls and pains, practical case histories. Subtitled: An Action Manual. Faint crease has faint creases to corners, minimum edgewear. No former owner's name. Text is unmarked. A good copy.. Soft Cover. Good. 9 x 6. N.Y.: HarperB, 1993. 220 pp + index. "A probing and incisive analysis of the major world transformation from the Age of Capitalism to the Knowledge Society and how it will affect society, economics, business, and politics now and in the years ahead." Dj has little signs of wear. a wee bit of fading to front edges. Not price clipped. New mylar cover.Tan paper on boards binding with black cloth spine is in excellent condition. Text is clean, secure, unmarked. No corner folds. Dj cond: v. good Book cond: v. good - near fine.. First Edition. HC and DJ. 9 1/2 x 6 1/2.